It’s time for Menu of Hope again! What is Menu of Hope, you ask? Well, here’s a FAQ. In sum, Menu for Hope is an annual fundraising hosted by Chez Pim. Last year, Menu for Hope raised an incredible $62,925.12 to help the UN World Food Programme feed the hungry. 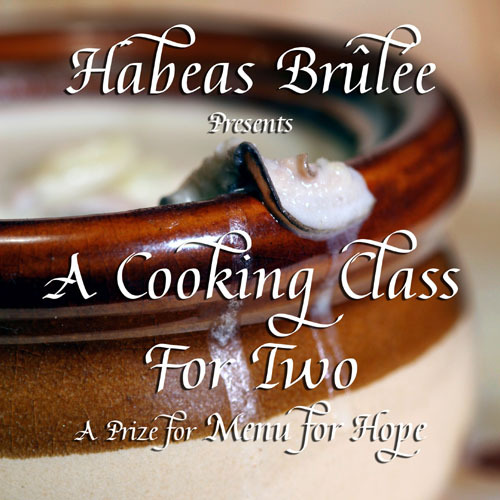 From December 10-21, food bloggers from all over the world will be offering food-related prizes for the Menu for Hope raffle. You can buy raffle tickets to bid on these prizes. Tickets cost $10 each, and you may buy as many tickets as you’d like for any one prize or for multiple prizes. At the end of the two-week campaign, the raffle tickets are drawn and the results announced on Chez Pim. You can learn about all the other East Coast prizes at Adam Kuban’s East Coast USA regional listing, and I encourage you to bid on not only my cooking class (Prize # UE31), but many of the other prizes as well! They’re not only for a good cause; they’re just plain tasty, too. The UN World Food Programme is the world’s largest food aid agency, working with over 1,000 other organizations in over 75 countries. In addition to providing food, the World Food Program helps hungry people to become self-reliant so that they escape hunger for good. With a special permission from the WFP, the funds raised by Menu for Hope 4 will be earmarked for the school lunch program in Lesotho, Africa. We chose to support the school lunch program because providing food for the children not only keeps them alive, but keeps them in school so that they learn the skills to feed themselves in the future. We chose to support the program in Lesotho because it is a model program in local procurement – buying food locally to support local farmers and the local economy. Instead of shipping surplus corn across the ocean, the WFP is buying directly from local subsistent farmers who practice conservation farming methods in Lesotho to feed the children there. Now, let’s get to the point; you want to know what I’m ready to put on the table. Well, here it is: Dave and I are offering to teach a cooking class for two! (Prize # UE31) Yes, that’s right, all the fun of cooking with us in our huge (for NYC) Park Slope kitchen, with us sharing all of our tips and tricks along the way. We’re happy to tailor the class to you. Want to learn to make kimchi, preserve lemons, and pitch yeast for mead? We can have a fermentation class! If you’re interested in learning sugar art, we can teach you to build a croquemouche or blow sugar bubbles. If you choose to bring your child in as your classmate, we’ll find a set of kid-friendly recipes to work on together. We can focus on a theme ingredient, technique, cuisine, or whatever interests you most! If you’ve ever read our recipes and thought a dish looked like something you’d like to eat, but wouldn’t have time to make yourself, come in and we’ll show you how fun and easy it can be to make it together. Or if you’d like something even more personalized, we’ll go through the fundamentals of tasting your spices and ingredients and developing a sense of which flavors and textures will go well together. Afterwards, we’ll cook a few dishes based on the flavor combinations we’ve discovered. Whether you’d rather learn some of our specialties, or explore a new cuisine or experimental recipes with us, we look forward to cooking with you! So, go bid! You’ve got until Dec 21 to buy your tickets. Just go to the First Giving Menu For Hope site and follow the instructions (as described below). To be in the running to win our cooking class for two!, you’ll need to enter the code ‘UE31′ in the personal message section. Is your prize number supposed to start with “UE”, or should it be “EU” like in the examples? It is supposed to start with “UE”, but thank you for making sure! What a nice contribution :). I love Menu for Hope. Oh I bet this will be very popular! Great donation! i want to win this one!!! please please please!!!!! i’ll even do your dishes after class.